Notes And Updates: We no longer have the order forms for the product mentioned in this Tech Tip. See the articles on Horst Probes for excellent replacement sensors for those that trap waste, giving inaccurate readings. Check them out under products. The seminars at this Rally were limited in number due to the other items on the agenda. 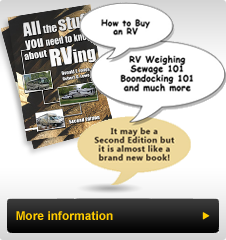 John Anderson from A'Weigh We Go gave two seminars on weighing motorhomes and tires. For anyone who attends a Rally for the first time, these are must attend seminars. I met with John and obtained his Safety Seminar Life on Wheels Textbook Edition Book, which we can review in upcoming Technical Topics. In addition, I met with a CCC Enterprises (Charles and Carol Christensen) who gave a seminar on Holding Tank Maintenance. Since they are Full-Timers and own a Bounder, I thought anyone who can give a seminar on this topic is worth listening to. As it turns out ... it was. Holding Tank Maintenance: One of the simplest suggestions they gave at this seminar was to fully fill your Holding Tanks with water before dumping them. This will force all odors out of the tank and if properly drained should leave them odor free. They cautioned us to never leave the dump valve open when parked at a campsite. The hardening of waste on the bottom of the tank could result in very expensive and difficult repairs. They were selling a product called Odor-Con, which is non-perfumed, biodegradable, a non-formaldehyde formula and safe enough to drink (why you would even consider this, I am not sure). This product destroys odors by oxidization and is used in hospitals, nursing and funeral homes, among other commercial applications. It is highly concentrated, using one or two tablespoons per tank and cheaper than the name brands at $0.56US per treatment. I thought it was interesting that it contains no perfume to hide the odor and they claim that if you use this product routinely it will oxidize the existing waste left in your holding tanks and clean them out with use. According to their material "Odor-Con is stabilized Chlorine Dioxide. Since it is stabilized it takes something to activate it. All odors are acid or acidic. The acidic odor releases the Chlorine, the Chlorine attacks the odor molecules, cracks the surface tension, the oxygen invades and destroys the odor molecules. It releases only enough Chlorine to control the amount of odor generated. The rest lays and waits until the next time it is needed, then it is activated." Apparently, because of its cleaning action you no longer require drain valve lubricant, and if you catch a bucket of gray water after its first use you will notice chunks of grease and food. After the third use the water will be clean. The only question they did not have an answer for was: "how do you get the holding tank monitors to read correctly and keep the sensors clean of paper waste?" If the tissues trapped on these sensors are attacked, by their product, they will be broken down however, we agreed that the best solution is sensors mounted on the exterior of the holding tanks. I purchased a container of Odor-Con and once I use up the name brand deodorizer, I will test this product and see how effective it is. I have the marketing material and odor forms if you are interested in trying it out. Short Tips: Ford Chassis rear brake rotors will rust on the inside (by the Backing plate), unless you firmly apply the brakes a number of times to clear the surface. The front face of the rotor is where the primary braking action occurs and the caliper must slide on the rails (which must be lubed regularly) to force the rear pad against the inner rotor surface. Since most of the braking action on a motorhome is on the front axle, unless you firmly apply the brakes, the rear brakes will rarely touch the inner rotor. We discovered this the hard way, after driving to and from Quebec on salt covered roads last winter. We cleaned the rig, parked it in an earth floor barn for three months. With the warm winter, we rusted the rear rotors and they required serious resurfacing to clean up. Hard brake application would have cleaned off the surfaces, then we would have had only some surface rust to wear off in the spring. The term: 'Use it or Lose it' applies.